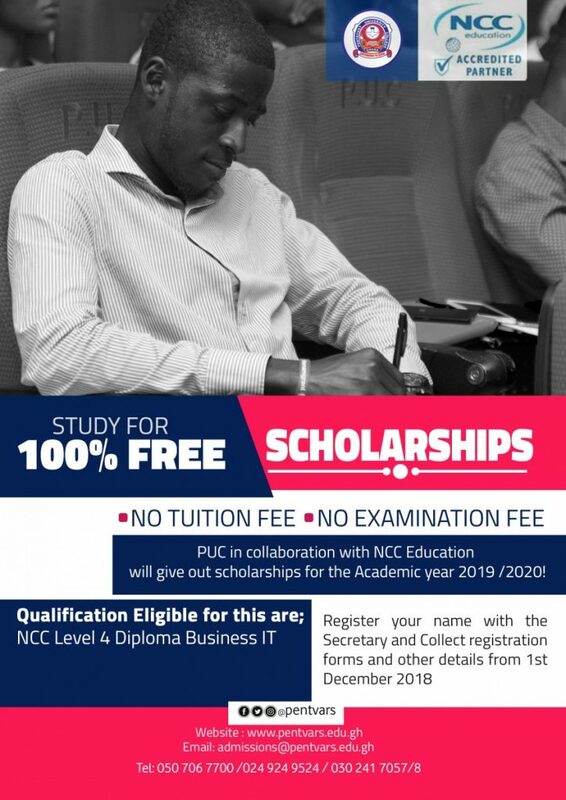 Pentecost University College (PUC) offers scholarships to students with a high level of need and good academic performance. The scholarships are available to all new and continuing Undergraduate students enrolled at PUC. The number and amount of scholarship awarded will be determined annually by the Scholarship Committee in consultation with the Donor(s). The award comprises the payment of Tuition Fees only. To provide scholarships to needy, but brilliant students to enable the individuals to pursue their Undergraduate programme. To provide scholarships to talented student-athletes, exceptional leaders and innovators. Applicant should be a student at the time he/she applies for a scholarship (evident by his/her admission letter). Newly admitted students must possess an aggregate of 6-18 from their West African Senior Secondary Certificate Examination (WASSCE) or equivalent. All forms must be sealed in an envelope and submitted to the Scholarship Coordinator’s office. All certificates and related documents submitted must be certified by a recognized official or by the institution that issued the documents and must bear the official stamp and signature of the certifier. Interested applicants are advised to apply before the beginning of the Academic Year (March to July) after they have received their admission letters. In awarding scholarships, the Scholarship Committee will look for applicants who have a strong need base and demonstrate very good intellectual skills. Applications will be received and reviewed at the beginning of each Academic Year. Shortlisted candidates will be called for interviews at a decided date by the Committee. The date for interviewing will be announced. The final selection will be announced after the interviewing process has been completed. The decisions of the Committee shall be final. Those nominated will be offered scholarships in writing and will be asked to accept or decline the offer also in writing within a 15 to 30 working day period. The maximum tenure of the scholarship is 4 years subject to the conditions of the student and availability of funds. This is also subject to review to ensure that beneficiaries maintain at least a minimum Cumulative Grade Point Average (CGPA) of 3.0. Students who fail to obtain the minimum CGPA of 3.0 will have their awards withdrawn. Any disciplinary action meted against the beneficiary from the University will result in immediate withdrawal of the award. Upon deferment of programme, the scholarship will be withdrawn. A student who wishes to defer the course must comply with Section 37 of the University College’s Student Handbook. Scholarship beneficiaries must follow the approved programmes and abide by the College`s rules, regulations and codes of conduct. Maintain full-time enrollment until completion of the undergraduate programme of study for which the scholarship is provided. Scholarship beneficiaries may not change their programme during the tenure of the scholarship. Maintain an acceptable level of academic standing (not below 3.0 CGPA). This award is only given once.